Hemsby Beach01493 846346work BeachHemsby Beach, near Great Yarmouth is a lively village resort with shops, amusements, attractions and cafes. The stunning golden, wide sandy beach with its grassy sand dunes makes this a popular choice with visitors. 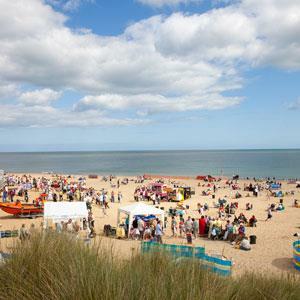 Hemsby Beach is also home to the Inshore Rescue and takes part in events such as the Herring Festival and the new Viking festival in June. All amenities are within easy reach along with deckchair hire, public & disabled toilets. Paid parking is available within a large car park next to the beach. RNLI lifeguards patrol between the red and yellow flags in summer between 10am and 6pm. Hemsby Beach, near Great Yarmouth is a lively village resort with shops, amusements, attractions and cafes. When arriving in Great Yarmouth follow the signposts for Caister on Sea. At roundabout take the 2nd exit onto Caister Bypass, signposted Hemsby. At second roundabout take 2nd exit and continue forward onto Scratby Road, turn right onto Yarmouth Way. First Buses run services between Great Yarmouth and Hemsby but these can be limited at certain times of year. Please chcek details before travelling.